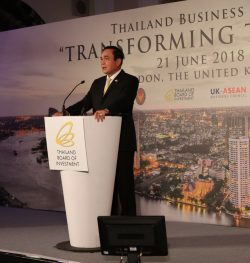 In opening the Thailand Business Forum, Prime Minister Prayut Chan-o-cha of Thailand, cited the deep and close relationship between Thailand and the UK and vowed that Thailand will always be a great friend to the UK. 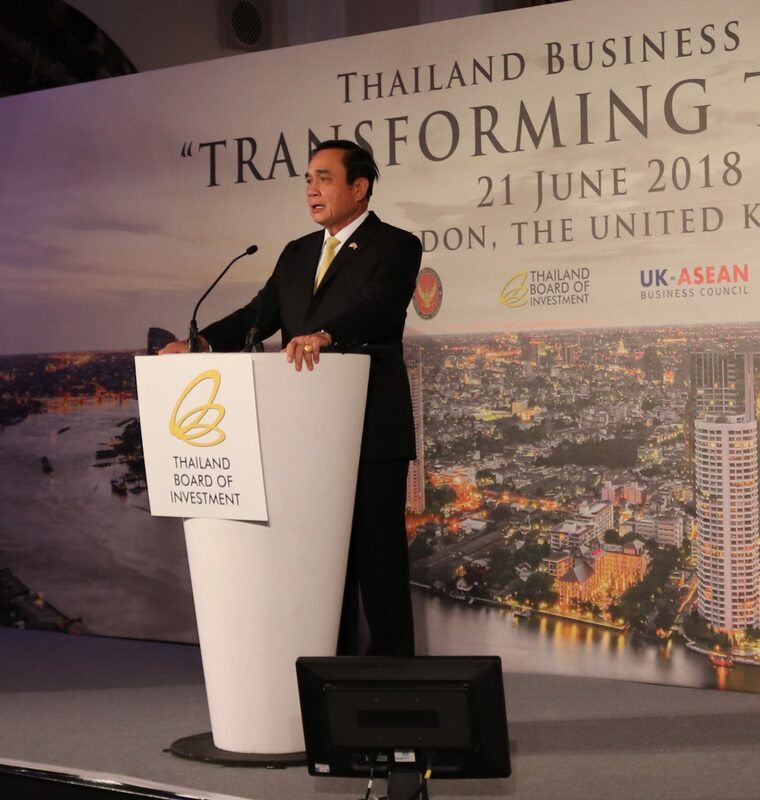 Prime Minister Prayut said that Thailand’s economy is growing at around 4% with a population close to 70m that includes a growing middle class. 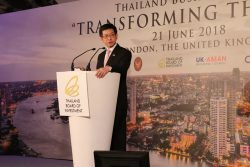 The Prime Minister emphasised that Thailand is also a key hub for ASEAN and UK companies can base themselves in Thailand to reach the wider region. This makes Thailand a very attractive destination to do business with and from, noting “Thailand is strategically located in ASEAN”. 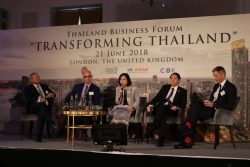 In particular, Thailand’s Eastern Economic Corridor has been designated as a special zone for investment and is well positioned to reach other parts of Thailand and the wider region. While Thailand is an agricultural based economy, the country is implementing its ‘Thailand 4.0’ strategy and wants to grow the economy with greater utilisation of science and technology. The agriculture sector will benefit from ‘smart farmers and smart fields’. 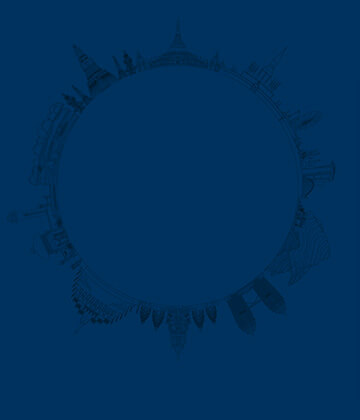 Innovation, science and technology are essential elements in Thailand 4.0. Underpinning all of this is education with the Prime Minister saying, “we need to invest in Human Resources so we can compete with the international community”. 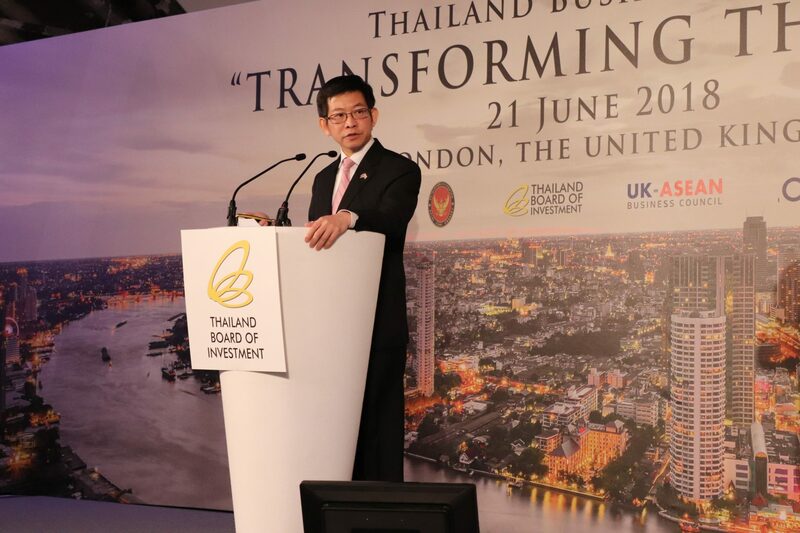 Following on from the Thai Prime Minister’s keynote, Minister of Industry of Thailand, Dr. Uttama Savanayana, delivered an address on ‘Driving Transformation through Thailand 4.0 and the Eastern Economic Corridor’. Minister Savanayana highlighted the Eastern Economic Corridor as a key strategic initiative and highlighted that Thailand is at the centre of the greater Mekong sub-region and surrounded by the world’s fastest growing economies of ASEAN, China and India. Minister Attached to the Prime Minister’s Office of Thailand H.E. Dr. Kobsak Pootrakool, spoke on ‘Reforms for Enhancing the Business Ecosystem’. Minister Pootrakool said “the government fully acknowledges the contribution of investment to the growth of the economy and national prosperity. 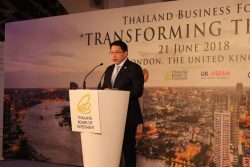 As such, efforts to improve and facilitate the business environment are an integral component of Thailand’s reform agenda”. Minister Pootrakool also highlighted that the changes being made has been reflected in the large jump of 20 places Thailand made in the World Bank’s ‘Ease of Doing Business’ rankings. Minister Pootrakool ended his talk with one promise; “once you have decided to embark on your investment journey in Thailand, the Thai government will be with you all the way, with our full support”. The panel discussion, moderated by Ross Hunter, Executive Director of the UK-ASEAN Business Council, focused on ‘Investment Support Measures and Business Opportunities’ and featured an insightful discussion with: Ms. Duangjai Asawachintachit, Secretary General, Thailand Board of Investment (BOI); Dr. Kanit Sangsubhan, Secretary General, Eastern Economic Corridor Office; Mr. Simon Shale, CEO, Senior Aerospace (Thailand); and Mr. Ray Gibbs, CEO, Haydale Graphene Industries. 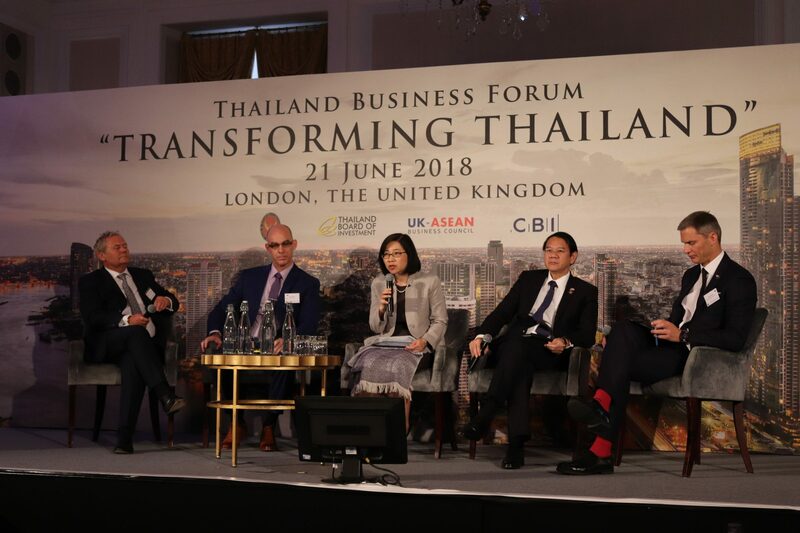 The panel highlighted the experiences of UK companies in Thailand with real life examples of support from the BOI and the Easter Economic Corridor Office. 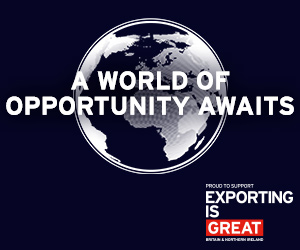 The UK places great importance in its relationship with Thailand, one of the UK’s oldest friends in SE Asia, with UK-Thailand trade dating back to the 17th Century. 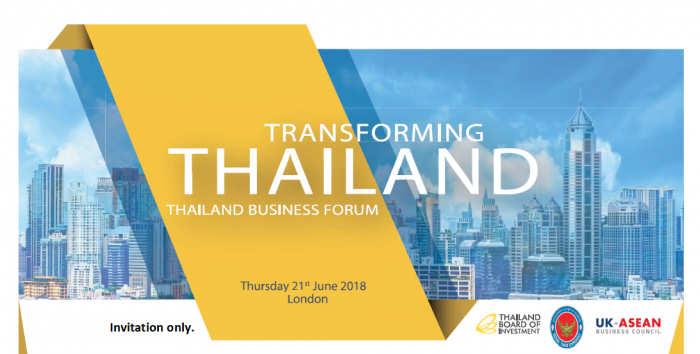 The Thailand Business Forum was organised by the Board of Investment of Thailand, the Royal Thai Embassy, the CBI and the UK-ASEAN Business Council and brought together over 200 delegates from a wide variety of industry sectors.